All Susan wants is a little protection from things that go bump in the night. Too bad her whole world is night. Now a murderous psychopath wants something she’s got. She’s trapped, she’s alone… and she’s blind. 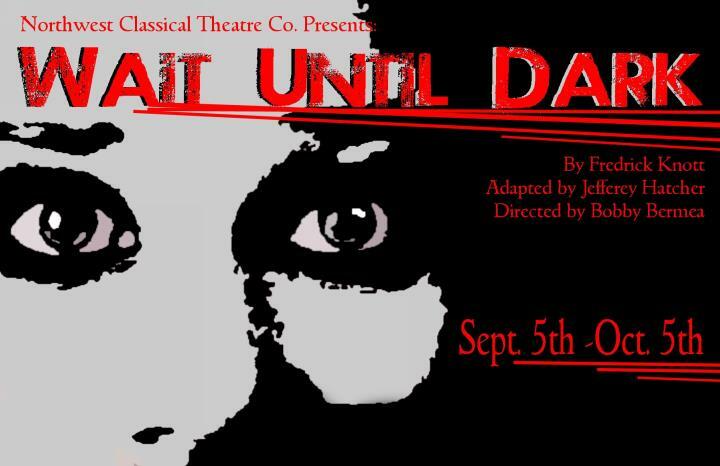 Wait Until Dark features Northwest Classical company member Clara Hillier as Susan joined by a collection of familiar faces like Heath Koerschgen, Tom Mounsey, and Steve Vanderzee, and welcomes new guest artists Sam Dinkowitz and Kate Thresher. Director Bobby Bermea is at the helm of this thriller in his NWCTC debut. Tickets are available online at www.nwctc.org. All performances at the Shoebox Theatre: 2110 SE 10th Avenue, Portland. When I was blind for two months, I discovered that the loss of sight was actually a gift in that it liberated the other senses to delve more deeply into their own relationship to stimuli. I look forward very much to this play in that I have lived with temporary blindness and have a very positive memory of life without dependence on a dominant sense (even though I love to read). I loved “Waiting for Godot”. is this theater group going to do anymore plays?